The Mimic stainless steel double mirrored bathroom cabinet with hinged doors from Ultra. Bring a touch of luxury and style to your new bathroom with a high quality Mimic Mirrored Cabinet. Q. What material is the back of the cabinet made of? 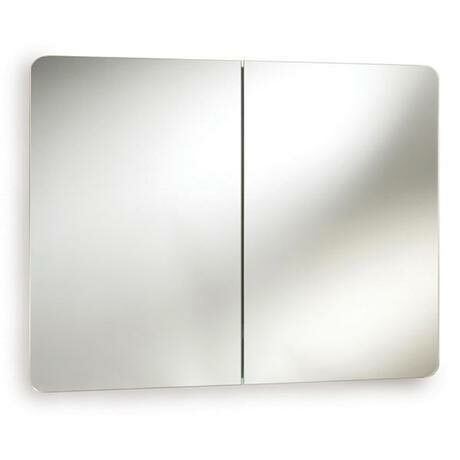 Hi, the Ultra Mimic Double Mirrored Cabinet is made from stainless steel all round. Thanks. Hi Margaret - apologies for the delay. We dont think so, unfortunately as there is a couple of cm of mirror that overhangs after the hinge pivots, so this would not have space to move. Have a little look at the dimensions drawing if this isn't clear enough, sorry!